With all this talk of PS4s and Xbox Ones, there has been a silent evolution occurring for years. Members of the PC Frat will tell you to keep your puny consoles and allow them to bask in the power of the Personal Computer. However, consoles try to catch up all the time e.g. PC may have received Update 11 for Warframe last month, but now the PlayStation 4 is hot on its heels. Valkyr – forged in the labs of the Zanuka project, Valkyr was subject to cruel experiments leaving her scarred, angry and frighteningly adept at killing. Ember Prime – Ember Prime joins the ranks of excalibur prime, mag prime and frost prime as the newest elite Tenno. 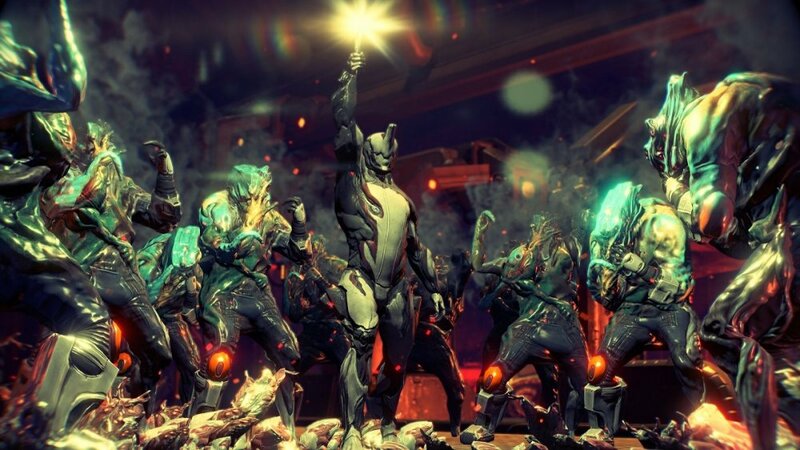 Two new bosses – take down Sargas Ruk and Alad V.
New tileset – the hunt for Alad V event will reveal the Corpus Gas City. Exciting new gameplay awaits for all who participate. New damage system – a re-vamped damage system breaks physical damage into puncturing, impact and slashing damage, causing differentiation between weapons and varied enemy resistance. Players will need to get to know the enemy to learn the best way to take them down. New weapons – the double-barreled Tigris shotgun, the half whip, half taser Corpus Lecta and the Cestra minigun are now available in the arsenal. New prime weapons – Glaive Prime and Sicarus prime join the elite prime arsenal! New resource drone – the Titan Extractor will travel the star chart and collect resources for you while you’re away from the game. New codex system – scans of enemies and objects reveal important information. New Warframe skins – eight new immortal skins for Warframe customization. New trading system – introduction of the trading post allows players to exchange goods within the game starting with mods and keys. Clan dojo updates – new areas including a trophy room, large garden, research labs and power room. Page created in 0.5967 seconds.